Former Port Allegany High School standout Nick Conway soared to new heights at the recent Northeast Conference Indoor Track and Field Championships, winning the NEC high jump title with a new personal best of 2.02 meters (6 feet, 7.5 inches) on Feb. 19 at Staten Island, N.Y. The Saint Francis University junior needed every centimeter of that leap to claim the gold, after he and top seed Dashawn Putman (Central Connecticut State) had both cleared 2.01m (6′ 7″) to force a tiebreaker. “It was a whirlwind of thoughts when they announced I had to compete in the jump-off,” Conway wrote in a message to the Reporter Argus. “They previously had told me I won….then recalculated and determined the jump-off had to happen. Initially I was not too excited. I was coming off of a groin strain that removed me from practice for 1.5 weeks leading up to the championship meet, on top of me not jumping in practice — maybe three times in practice all year. So I was the clear-cut underdog against the number one seed. At least one person at the Ocean Breeze Track & Field Athletic Complex already had a good feeling about the outcome, though — Port assistant coach Hunter Conway, watching from the stands with his wife, Tammy. Conway was one of four jumpers to succeed at 2.01m, including two of his Red Flash teammates, but he and Putman did so in the fewest attempts to move on to the tiebreaker. With the bar reset at 2.04m (6′ 8.25”), both missed on their first try. Of course, there was at least one more jump left, with Putman getting a chance to match Conway’s height and send the competition to another round. Once again, their reaction told him all he needed to know. The conference title was the second for Conway, who won the 60-meter hurdles at last season’s indoor championships. He placed fifth this year, turning in a time of 8.24 seconds to qualify in that event as well as the high jump for this weekend’s IC4A/ECAC Championships at Boston University. Nick Conway stepped down off the medal stand, gingerly walked back across the Shippensburg University football field, placed his hardware from the 300-meter hurdles into his backpack, and started loosening up for his next high jump attempt. There was still more work to be done. It was evident, though, that the Port Allegany senior’s busy schedule during the second day of the PIAA Track and Field Championships had taken its toll. Exhausted and sore from his third hurdles race of the day, he was successful on his second attempt at 6 feet, 2 inches, but 6-4 – a height he’d easily cleared at districts last week – was out of reach, leaving him tied for 10th in the event to go along with fourth-place finishes in both the 110 and 300. Conway’s Saturday morning began with placing fourth overall in the 110 semifinals, then matching that finish in the final with a time of 14.80 seconds, .03 faster than his third-place time from last year’s state meet. From there, it was off to the high jump, where both he and Gator teammate Tyce Miller cleared 5-10 and 6-0 before Conway had to leave for the 300 finals. While the rest of the jumpers stretched and relaxed, it was another fast race (40.25 seconds) and another trip to the medal stand for Conway – with a meet official waiting to hustle him back over to jump again. “It was a long day at best,” he said. “I was trying to run 14.8 consistently, 14.7, below that, twice in a row. It takes a lot out of you. I kept hitting hurdles and my knee’s all bruised up now. And then the 300s, that was tough. I don’t even know what time I ran. I felt like I was going to jail – the lady came over and took me away before I even saw what time I ran. Although Conway fell short in his quest to join ‘Chip’ O’Malley (shot put, 1978) and Heather Amell (400-meter dash, 1991) as Port Allegany’s only track state champs, his legacy is secure in the pages of the PAHS record book, where he erased longstanding marks in both hurdles events (14.64 seconds in the 110, 39.17 in the 300), the 200-meter dash (22.4), and the high jump (6 feet, 7 inches). “6-7’s not going to be touched. That’s going to be there for a while,” Riley said. With his long day finally over, Conway pulled both medals out of his bag and put them on, then gathered up the rest of his gear. He adjusted his grip on the strap of his backpack, and then, medals clinking together with each step, he headed for the gate. Five other Gator athletes made the trip to states along with Riley and assistant coach Dan Eskesen. Friday evening, with twilight closing in and the remaining spectators huddled in the bleachers against the unseasonably cool temperatures and gusting winds, the 4×400-meter relay team of Miller, Tyler Kittilson, Sam Kysor and Josh Poorman finished seventh in their preliminary heat and 28th overall, improving three spots from their No. 31 seed. On Saturday, Miller tied for 15th in the high jump at 6-0. “I think the guys had fun,” Riley said. “Tyce hit what he usually hits, six feet. Once in a while he gets 6-2. The boys ran their 4-by-4. It was slow” – their time of 3:47.26 was 12 seconds behind last week’s record-setting run at districts – “but it was also brutally cold and 35-mile-an-hour winds. We wanted to be better than what we came in at and we wanted to reset the school record, which weather conditions just didn’t allow. But they put forth the effort, they worked hard all week, and they got here. Reflecting on the 2013 season as a whole, Riley couldn’t complain about the results, which included the boys’ sixth straight North Tier League championship. “All in all, I think we had a pretty decent year. You can’t say you didn’t have a decent year when you bring a kid to states and he goes home with medals. But this coach didn’t have a whole lot to do with that,” he said with a laugh. “Hunter Conway is a decent, very good high jump/hurdle coach. Watching the interaction through the last few years with him and those kids, watching the hand signals that were being sent to the kids from behind the fence because coaches aren’t allowed anywhere near the kids during their events … He got the best out of them, and hopefully he’ll come back and help out again next year. 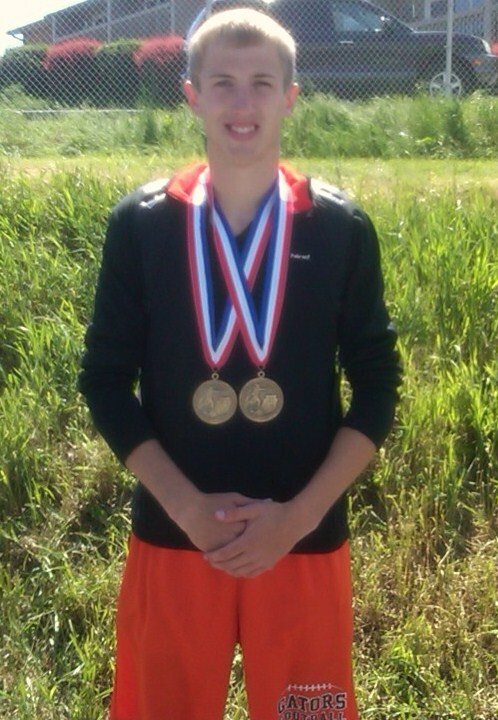 Seven other NTL athletes also earned PIAA medals last weekend, led by Barrett Kemp’s third-place finish of 9:19.08 in the 3200-meter run. Coudersport’s Mitch Freeman also medaled for the second time, throwing the discus 155 feet, 0 inches to place sixth in Class AA. “I was hoping for top-three, but those guys were throwing pretty far. I was happy with sixth – improved from last year when I got seventh,” he said. The Northern Potter boys 4×800-meter relay team of Matt Morgan, Aaron Schweigart, Ethan Kibbe, and Aaron Olney finished sixth in 8:15.32 – inches behind fifth-place Northeast Bradford (8:15.10) – for their moment on the medal stand, while Sheffield’s Jen Isenberg threw the javelin 123 feet, 10 inches to earn seventh place. Freeman’s Falcon teammate, Jenna Gabreski, finished 14th in the triple jump with a distance of 35 feet, 3/4 inches. Gabe Rees (OV), seeded 19th going into the boys 3200, finished 17th in 10:05.55, and OV’s 4×800 relay team of Spencer Cole, Spencer Howard, Kemp, and Rees finished 10th in their qualifying heat. The 2013 District 9 Class AA track and field championships ended as they began on Friday night, with a new Port Allegany High School record clinching a trip to the state meet in Shippensburg. But while the only drama in the first result was whether or not Nick Conway would also break the D-9 high-jump mark on the way to the first of his three gold medals, the last one came down to the final few steps of the final race of the night. After dropping behind the lead runners at the start of the anchor leg of the 1600-meter relay, and still in fourth coming out of the last curve, Port’s Josh Poorman made his move. Passing runners from Northern Potter and Kane in the final 75 meters, he crossed the line in second place – and a school record 3:34.59, shattering the old mark by a full second – to grab the last PIAA qualifying spot of the meet and set off a celebration with teammates Tyce Miller, Tyler Kittilson, and Sam Kysor. Port coach George Riley, who sprinted across the Kane High School track to join the group hug in the infield, was still on Cloud Nine afterward. “I couldn’t believe that he fell behind as quick as he did, and I thought, ‘Wow, maybe we’re just done,’” he said. “And then the same Josh we saw last week at the NTLs is the one that came out of the corner and went and got it. It was just impressive. The whole team was impressive. Nobody was at 55 (seconds), they were all below 55 for their splits, which is what we said we had to have for the record. “Tyce ran a good first leg, around 53 at the exchange. T.K. ran a beautiful – I think his fastest 400. Sammy, who’s only run a couple of 400s, was under 55, which was a godsend. And then Josh finishing strong. He wanted it. He’s got the biggest heart on the team. Kysor, a late replacement, didn’t even know he was running until that morning. Earlier in the meet, Conway cleared the high-jump bar at 6 feet, 7 inches – seven inches past Miller, the only other entrant to make it to six feet – to better his own PAHS standard before coming up just short at his attempts to break the 1999 district mark of 6-8. The 1-2 Gator finish earned both seniors a trip to states – Conway’s third, Miller’s first. “That was nice. We’ve been imagining that all year, and it worked out in our favor,” Conway said. Conway’s gold rush didn’t end there, as the Division I-bound star defended his titles in both the 110- and 300-meter hurdles and added silver in the 200 to claim the James Manners Award as the meet’s outstanding male athlete. “Something I never imagined would happen, but it feels great,” said the six-time D-9 champ who, with a decent chance to earn Port’s first PIAA gold since Heather Amell won the 400 in 1991, has opted to scratch from the 200 to conserve energy for his main events. While no other Gators will be making the long trip to compete in Shippensburg, Rex Windsor (fifth, discus), Lynae Delacour (third, 300 hurdles), Krista Miller (fourth, 800 and sixth, 400), and Rachel Taylor (fourth, shot put) each had their moment on the medal stand, the girls’ 1600 relay team came within two-tenths of a second of yet another school record, and the boys finished second to Kane in team scoring for the second consecutive year. Brookville, led by two-time Manners Award recipient Lanae Newsome, won the girls’ title, while Port’s tie for ninth was the best showing by a North Tier League team. Boys: Kane 80.5, Port Allegany 61, Brookville 54, Clarion 47, Oswayo Valley 43, Karns City/Northern Potter 38 (tie), ECC 31, Johnsonburg/North Clarion 30 (tie), Union 24, Moniteau 22, Sheffield 15, Redbank Valley 13.5, Coudersport 12, Keystone 7, Cameron County/Otto-Eldred 5 (tie), Allegheny-Clarion Valley 2.
javelin: 4. Justin Zetwick (O-E) 161-4, 5. Ryan West (OV) 158-3. Girls: Brookville 98, Kane 73, ECC 70, Karns City 63, Johnsonburg 53, St. Marys 39, Clarion 27, Cranberry 20, Redbank Valley/Port Allegany 16 (tie), DCC/Moniteau 14 (tie), North Clarion 12, Allegheny-Clarion Valley 11, Curwensville 10, Northern Potter 8, Coudersport 6, Sheffield 4, Clarion-Limestone/Otto-Eldred 2 (tie). javelin: 4. Jen Isenberg (Sh) 127-1q, 6. Mariah Hartzell (O-E) 105-8. MECHANICSBURG, PA: The Pennsylvania Interscholastic Athletic Association (PIAA) celebrates its 40th Girls’ and 89th Boys’track competitions with the 2013 Championship meet at Shippensburg University of Pennsylvania this Friday, May 24 and Saturday, May 25, 2013. Shippensburg University has served as continuous host of the championships since 1976. Competition begins Friday morning at 9:00 am with track and field events being held concurrently throughout the day. Saturday’s competition is also scheduled to begin at 9:00 am. A detailed time schedule is available for all events at http://www.piaa.org. Ticketsfor the Championships are available each day of competition at Shippensburg University at a cost of $6.00 for adults and $3.00 for students(K‐12) on Friday. Saturday ticket prices are $8.00 and $4.00 for adults and students, respectively. In addition, series tickets valid for both days of competition are available in advance on‐line from Ticketleap at http://piaa.ticketleap.com. Television coverage of the event is available on a tape delayed basis from the Pennsylvania Cable Network (PCN) beginning at 5:00pm on Saturday. In addition, PCN will provide live web streaming of Saturday’s events through their website. A detailed schedule of PCN’s broadcast times and the web stream is available at http://www.pcntv.com. The Track and Field Championships is the largest PIAA event for participants, with over 2,600 student-athletes competing this year over the four classifications. Qualification of those athletes is determined by place and/or exceeding qualifying standards at each of the 12 District Championships sponsored regionally across the state this past week. Champions will be crowned in each of the 18 events contested in AA and AAA girls and boys, respectively, as well as overall team championship awards in each of the classifications. Join us Friday and Saturday and witness future Olympic hopefuls such as past PIAA Champions Hyleas Fountain (Central Dauphin East), Lauryn Williams (Rochester), Tony Darden (Norristown), and Leroy Burrell (Pennwood). Nick Conway’s father and stepmother, Hunter and Tammy Conway (left), and PAHS track and field coach George Riley watch as the Port Allegany senior inks his National Letter of Intent with Saint Francis (Pa.) University. 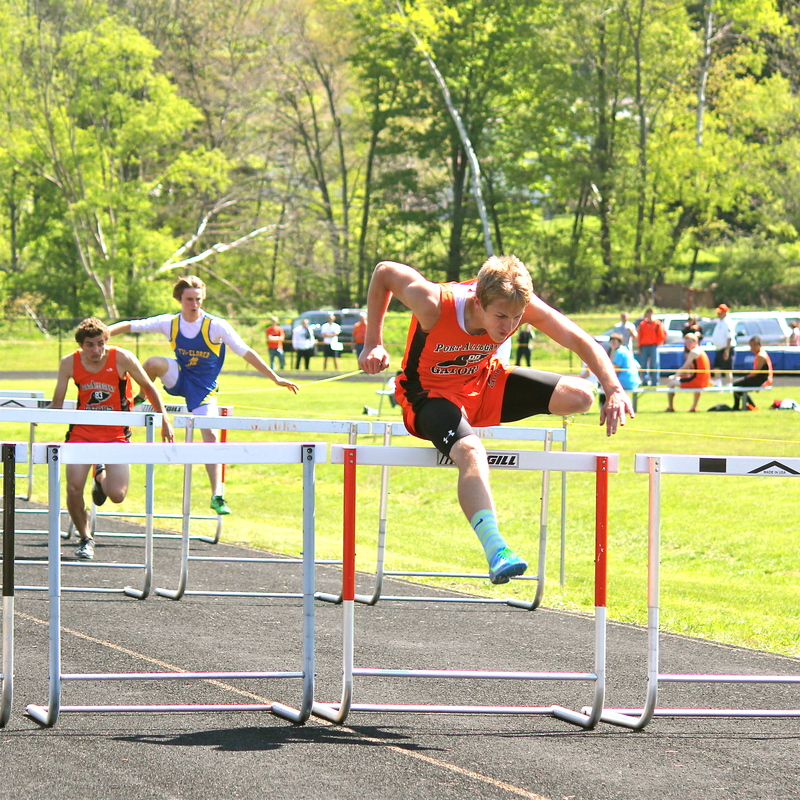 Two trips to the PIAA state track and field championships, including a third-place finish in the Class AA 110-meter hurdles last May, put Nick Conway on the radar of several college programs. 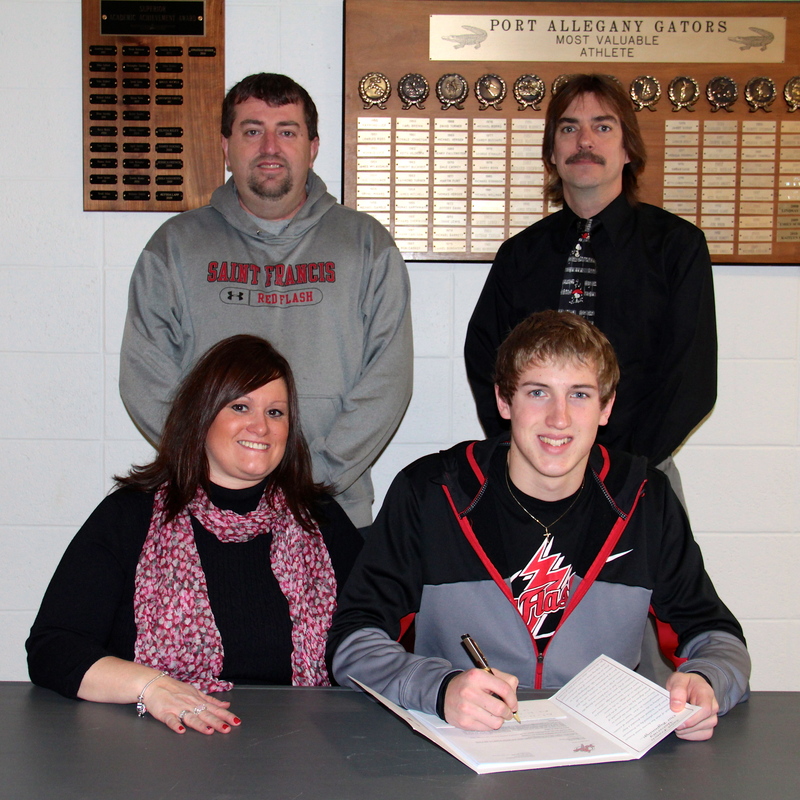 Last weekend, the Port Allegany High School speedster made it official: The top student in the Class of 2013 is headed to Division I, where he intends to continue his running and academic careers at Saint Francis University in Loretto, Pa.
“What we’re looking for is obviously talented, but tough, hardworking, intelligent student-athletes, and we’re also looking for men and women of character. Nick fills all of those qualifications,” said Red Flash head coach Douglas Hoover. “We’re a unique Division I institution, and I feel like Nick is a very good fit for us on that front. He’s someone we’re looking to develop across all of our event areas in track and field. Nick certainly helps us out on the hurdling front, and he’s obviously just a talented student-athlete in general. He’s high-jumped very well, he’s done some other events very well too. He’s just a tough, hard-nosed, hardworking student-athlete, and that’s what we’re looking for. Conway clears a hurdle well in front of the rest of the field at last May’s North Tier League meet. The two-time defending 110-meter District 9 champ, who also made several All-State football squads and the MaxPreps.com Small-School All-American second team as the Gators advanced to the state semifinals last fall, has spent the winter honing his skills on the indoor circuit. His personal record of 8.21 seconds in the 60-meter hurdles is the third-best in Pennsylvania and the 21st-fastest in the country this year in times reported to Milesplit.us, earning the Port senior First Team Elite status from the national website. “When he first came out (for track) he had some quickness, he had some speed, and I think the genetic makeup because Dad had done this,” said Port Allegany track and field coach George Riley, noting that Conway’s father Hunter, who works with the Gator hurdlers and high jumpers, won a Delaware state championship in the event. “But as the first year went along, you realized that you had – I always compare him to Mikey Mitchell (the two-time state 300-meter champ from Smethport) – you had the Mike Mitchell who dominated the hurdles in the North Tier League for four years. I was like, okay, this is lovely. No, I didn’t expect it, but once you started to see it come together you knew you had something special. For the younger Conway, hearing about his father’s exploits helped spark his competitive spirit. That desire was evident to Riley early on. This 54-yard touchdown catch in the District 9 championship game last November, Conway’s third of the afternoon, also set a title-game record for receiving yards with 203. 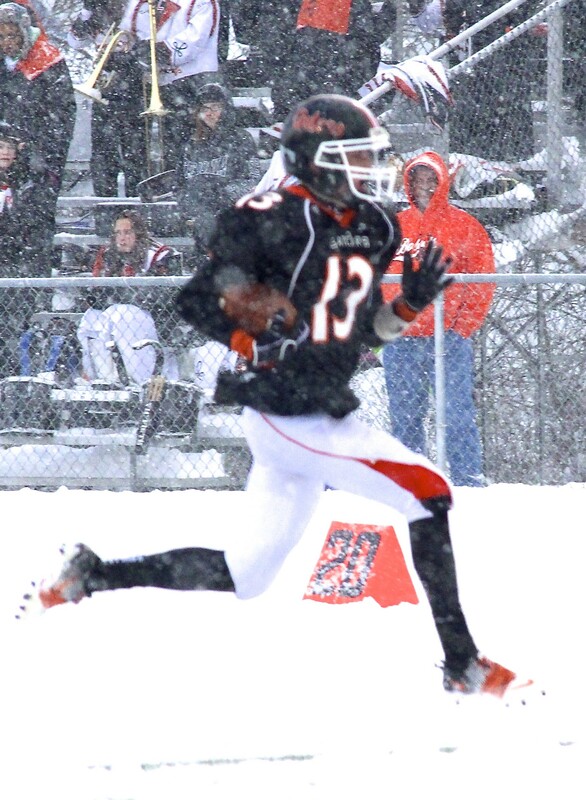 A MaxPreps.com second-team Small School All-American wide receiver in 2012, he also owns the D-9 single-season marks for yardage (1,482) and touchdowns (24). At least six colleges contacted Conway about competing for them, but he quickly decided Saint Francis, a member of the Northeast Conference, was the right fit. “I kind of made it real apparent that I put my education over my athletics,” he said. “I really want to be a doctor, and I chose the physical-therapy route to do so, and there are only three schools in Pennsylvania that have a guaranteed program (St. Francis, Gannon, Duquesne). He’s also anticipating working with Red Flash sprints/hurdles coach Augustine Schmader, who ran in the Olympics for his native Liberia before coming to the United States and winning a national championship at Lincoln University. Hoover, who started talking to Conway soon after taking over the program last summer, is looking forward to it as well. With the books officially closed on the 2011 Pennsylvania high school track and field season following last weekend’s PIAA championships at Shippensburg University, two Port Allegany Gators can lay claim to being among the top 20 Class AA athletes in the state in their events. Crossing the line on the Seth Grove Stadium track in :15.55, Nick Conway finished fifth in his 110-meter hurdles preliminary heat. The time put him in 17th place – an agonizing one-one hundredth of a second out of 16th, and the last available spot in the semifinals. “That’s not a bad showing,” coach George Riley said. “His heat was the closest. Out of eight lanes, I think seven were right on Nick’s time. They were right there at the finish line. He was very disappointed, and I told him, Look. You were upset with the mental aspect (unfamiliar starting blocks), and it was 85 degrees. And it was a fast race, and he hasn’t seen any competition all year. Cyniel Hinton (Summit Academy) won the Class AA championship in :14.99. The Class AAA race was even faster, with Strath Haven’s Chris Williams blazing to the tape in :14.18 and the top seven finishers all going underneath the 15-second mark. Meanwhile, three days after throwing more than 100 pitches in the baseball team’s playoff loss to Smethport, senior Camrin Stuckey finished 14th in the javelin competition at 162 feet, 5 inches. Rob Robbins (Northeast Bradford) won the Class AA event with a throw of 221-6, obliterating the old PIAA record by almost eight feet. Although no North Tier League athletes managed to capture a state title, Sheffield speedster Kalil Slaughter came up inches short in the 100-meter dash, finishing second in :11.19. Two Potter County athletes also earned spots on the podium, with Oswayo Valley sophomore Barrett Kemp placing third in the 3,200-meter run – barely two seconds off the winning time – and Northern Potter senior Andrew Morgan taking sixth in the 1,600. Back in Port, as Riley reflected on the Gators’ season, he saw plenty to be happy about. “The boys’ winning streak is intact. The girls had a successful year. Two kids went to states. Districts was good. First time I think we’ve ever won the North Tier League meet (during Riley’s tenure as head coach), so I think it was a good year,” he said.